The Country Music Hall of Fame is a ‘must see’ destination for visitors or hometown tourists. 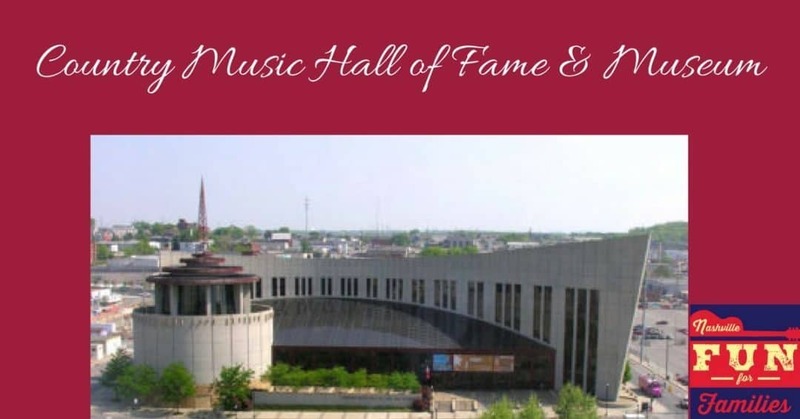 Located in the heart of downtown Nashville, the Hall of Fame is a treat for your eyes and ears. The building that currently houses the Hall of Fame was opened in 2001. The architecture is so interesting. Make sure to give yourself enough time to walk around the outside and take in all the cool features. Your first challenge will be parking. There are several paid lots surrounding the Hall of Fame. Make sure you pay for at least 4 hours of parking so you don’t have to rush through your tour. Several lots offer discounts to Hall of Fame tours. You can find those locations at this link. (Scroll down to the far right). The entrance to the Hall of Fame leads directly into a huge open courtyard area. To your right is an information booth and The Museum Store. If you are in the market for music souvenirs or sequined t-shirts, then don’t miss this store! The middle of the courtyard is filled with tables where you can relax or have a meal. There is a small cafe in front that sells snacks and drinks. To the far left, you will find the ticket booth. There are several ticket packages available. You may choose to tour the Hall of Fame only or you can also add the RCA Studio B Tour and/or the audio tour with Bill Cody to enhance your experience. I would really urge you to take advantage of both these ‘extras’. The RCA Studio B Tour is just amazing. It was the highlight of our visit. See our review of the tour here. The celebrity audio tour will really enhance your tour experience. It’s like having Dolly Parton as your tour guide! Don’t even try to tell me that doesn’t interest you. 🙂 The handheld wand has a built in speaker that you just hold up to your ear. It is much easier to use than the models that use headphones. To enter the museum, you will first have to take an elevator to the third floor. Once there, the permanent collection will be to your right. To the left is a small area with exhibits that change periodically. When we visited, the Patsy Cline exhibit was on display. There was a video presentation and lots of memorabilia to see. The permanent collection showcases country music from it’s origins to present day. The display floor is huge. There are instruments, costumes and even cars on display. As you tour the exhibit, you will see several kiosks along the way. These unique areas each highlight a different song with significance in the evolution of country music. The kiosks are designed to block out outside noise so you can really experience the song. If you do this tour with a ‘real’ music lover, you won’t be able to drag them out of these spots. There are lots of interactive displays scattered throughout the museum. There is a spot with seats and computer monitors where your child can design a costume or watch video clips. This is about halfway through the museum so it’s also a great spot to sit and relax a bit. There is also a table with art supplies to entertain little ones for a few minutes. This area faces the wall of gold records. This massive display is simply amazing. Several of the records will actually play the song they represent! The museum tour actually covers two floors. Elevators are large and plentiful so wheelchair and strollers will give you no problems on this tour. As you continue the tour through the second floor, you will see more of the ‘modern’ era of country music. One of the pieces on display is Dolly Parton’s handwritten lyrics to the song “Jolene”. Ya’ll…you know I had a moment over that display, right? The tour wraps up here and a large ramp will take you right back to the open courtyard where you entered the building. The Country Music Hall of Fame is a great place for family fun. My kids (ages 10-14) really enjoyed it. But they are all music lovers. If you have kids that won’t even listen to country music or energetic toddlers who won’t stay in a stroller, then maybe this tour is not your best choice for family fun. But for the rest of us, it is entertaining and educational. The Country Music Hall of Fame is the kind of place that makes me really proud of Nashville. One of the oldest letterpress print shops in America and a true Nashville icon. Due to limited availability and tour schedules, the Hatch Show Print tour is only available for purchase by phone or at the Museum. The audio tour is so awesome. Really cool to listen to all the stars of country music. I’ve been there twice and plan to make a trip there again next summer! We love the audio tour too!